In 1990, Lufthansa began Boeing 747 service to Germany; this service was, however, discontinued shortly thereafter. In 1994, British Airways began service to London via a "global alliance" with USAir. This was later discontinued, as the airlines chose different alliances (though they now are both in Oneworld). Lufthansa restarted service to Charlotte in 2003 and now operates flights between Charlotte and Munich, utilizing their Airbus A350-900 fleet. Prior to March 31, 2019, the Lufthansa flew their Airbus A340-600 and Airbus A330-300 aircraft on the route. Concourse D has 13 gates and serves as the international concourse. All international arrivals without customs preclearance are handled at this facility. Also, American operates some domestic flights from this concourse. It is also used by Lufthansa, VivaAerobús, and Volaris. It opened in 1990. On February 15, 2017, American Eagle Flight 5320 heading to Gulfport–Biloxi International Airport struck a deer while taking off from runway 36 center. The Bombardier CRJ700 was forced to turn around and abort the flight. The plane could be seen trailing a vapor stream from the right wing as it circled back to land. Officials said there was a fuel leak, and crews sprayed the plane with foam. There were no injuries. ^ a b "W.P.A. / Douglas Airport Hangar". www.cmhpf.org. Retrieved July 16, 2018. ^ "To Douglas Municipal Airport Effective April 15, 1975". www.departedflights.com. Retrieved July 16, 2018. ^ "Airlines and Aircraft Serving Charlotte Effective April 15, 1975". www.departedflights.com. Retrieved July 16, 2018. ^ "Charlotte Douglas Municipal Airport – 1979". DepartedFlights.com. Retrieved September 11, 2015. ^ a b "CLT 2015". www.cltairport.com. Retrieved February 7, 2017. ^ "Terminal Eastside Expansion". www.cltairport.com. Retrieved February 7, 2017. ^ Ordonez, Franco (February 25, 2013). "N.C. Gov. McCrory: Airport dispute is between 'factions within Charlotte'". McClatchy Washington Bureau. 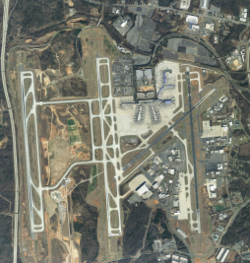 ^ "Charlotte Douglas International Airport (CLT)". Retrieved December 29, 2018. ^ "Flight Schedules". Retrieved April 2, 2017. ^ a b "Flight schedules and notifications". Retrieved April 2, 2017. ^ "Contour Airlines - Destinations". Retrieved October 31, 2018. ^ a b "FLIGHT SCHEDULES". Retrieved April 2, 2017. ^ "Route Map | Frontier Airlines". Retrieved October 31, 2018. ^ "JetBlue Airlines Timetable". Retrieved April 2, 2017. ^ "Timetable". Retrieved April 2, 2017. ^ "Check Flight Schedules". Retrieved April 2, 2017. ^ "Daily Flight Schedule" (PDF). Retrieved April 2, 2017. ^ a b "Timetable". Retrieved April 2, 2017. ^ "Viva Aerobus Arrives in Charlotte". Retrieved March 10, 2019. ^ "Volaris | Our Destinations". Retrieved October 31, 2018. ^ "Airport Sprinter". Charlotte Center City. Retrieved January 22, 2019. ^ Hanson, Blake (February 17, 2017). "Plane Hits Deer: 44 Passengers Evacuated After Emergency Landing in Charlotte". WSOC. Retrieved April 28, 2017.